Dhaani asked him not to be angry and she was fine. Viplav left angrily. Dulaari went to Raj Lakshmi and asked if she had informed Dhaani. She replied yes. Neighbors told her to speak the reason to hurry in marriage. They both praised Viplav. Neighbors gave blessings to the Jodi. Vipav asked Kanak reason to hit Dhaani. Viplav holds Dhaani’s hand and took her in room. Dadaji knocked the door. 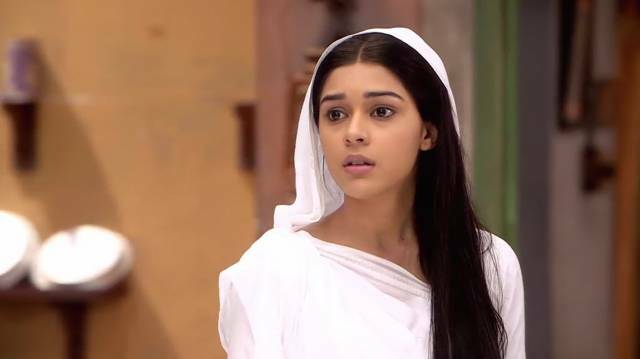 Viplav stated that Kanak had crossed her limits and hit Dhaani with belan, and asked her to leave the house. Dhani said it was just an accident and Maaji had no mistake. She reminded him that Dadaji were standing outside and to open the door. Viplav said if there is no rescept of my wife, then I would also leave this house. Dhaani folded her hands and asked for time from Dadaji to convince Viplav. Once he went, she acted to get pain. Viplav asked her. Dhaani said the pain would be gone when his anger would be gone and told that Kanak is angry as Shalu’s marriage was broken. She thought Raja to be nice and said even her mum also got angry about the wedding. Viplav said Dulaari and Kanak are different. Dhaani told her that she would win everyone and came to unite the family and wouldn’t lose hope. She asked her to understand carefully and not to be angry. Viplav was charmed by her goodness. Kanak told Dhashrath that she couldn’t change her hatred for Dhaani. Dhashrath asked to wait for the right time. She shouted. He reminded that she was talking to him. She said that dhaani would bring heir and they couldn’t do anything. Viplav talked about their baby. Dhaani replied not to do gandi baat and said they had to go in pooja, Dulaari invited and asked him to talk to kanak first. Viplav saw Kanak talking to herself about his son’d happiness. He hugged her. Kanak asked him not leave her. He said if she loved him, she should accept Dhaani as my wife and asked if her anger is more than love. Dhaani came and asked if they can go in pooja. Dhashrath came and gave permission and as ked Kanak to give keys to Dhaani. Dhani said she didn’t want. Viplav told she stopped him leaving the house. Dhashrath asked them to go. Shalu met raja and said she loved him a lot and wanted to marry him. Raja said that if love is true they would meet and asked her not to hurt her family and said he doesn’t want to meet but the love tends to and dropped her home. Viplav and Dhaani saw Shalu coming and asked where she was coming from. She lied that she went to friend. Dhaani invited Shaalu for puja. She refused. Viplav asked her to sit in car. She saw honeymoon travel brochure and said that she hope to go there. Viplav said we would go and ask for her passport. Dhaani asked about expenses. Viplav said he was getting cases and would earn money. Dhaani smiled broadly. Great show! Cannot get enough of Viplav and Duanni’s romantic scenes. Great chemistry between these two actors, they put life into their characters……..love the show.